To ride from Trujillo to Lima we could have biked for about 500 km along the flat and windy coastal road.... or we could climb up into the mountains and ride alongside the incredible Cordillera Blanca, and then cruise back down the coast. Needless to say, we chose the later. The past two weeks have shown us that Peru is a land of extremes. From the beauty of the moutains to the bleak and harsh coastal conditions....it seems to be many worlds in one. We spent a total of four nights at Lucho´s Casa de Ciclista. A pretty magical place, Lucho has more energy than anyone I have ever met. He is up until the wee hours of the morning... working on about ten different projects at once, and he is always ready to help cyclists coming through. Almost every night there was some sort of festivity... from a drum party in the common area, to poker late into the night. It is the kind of place where cyclists tend to get stuck, each day saying ´I´ll leave tomorrow´ ... Yet tomorrow never quite comes. After I got my test results back, and everything seemed to be normal, we were ready to go... but of course, everyone said ´just stay one more day´. Tempting as it was to stay a little longer, we tore ourselves away and answered the call of the open road. After much debate we decided to head into the mountains from Trujillo. The route, which is famous among touring cyclists, would take along dirt and gravel roads for 150 km or so, and would wind its way along the Rio Santa. Our first day, to the town of Chao, was along the Panamericana. We were fortuante to have a rare sunny day, this time of year it is generally foggy and damp along the coast. The sand dunes were golden, and we were tempted to just carry on along the coast... but the pull of the mountains was strong. On our second day we turned on to a private dirt road... heading towards the hills. It was the best scenery that we have had on our trip yet, and at last we were on a quiet road free of incessant honking and speeding trucks. The road was quite smooth in some place, but very rough in others...making it a little frustrating to navigate with our heavy loads and skinny tires. Luckily the climb was very gradual, probably a max of 1-2% grade. Even so, by the time we made it to the town of Chuquicara, where we would find food and water and a place to camp, it was almost dark. The kind gas station owner offered us a place to camp in the thatched hut across the road, which doubled as the church on sundays. We made a quick dinner, and fell asleep fast. More dirt on our third day, we had about 60 km to get to the next town, but we had stocked up on food in case we would need to camp. It was very slow going as the road was in worse condition as we carried on. Around 4pm we had only done about 40 km, but we were both thoroughly rattled, and decided to camp by the river. The river itself was fillled with silt, so we had to collect water, then let it settle for awhile before siffoning the cleaner water out to filter for drinking and cooking. It was probably one of the most peaceful nights we have had since Northern Canada, or Baja California.... only the roar of the river to keep us up. On our fourth day we finally had to do some real climbing, with grades over 5%. The road continued to be quite rough, and sandy at times... but still, we rarely had to walk to the bikes. We stopped in the town of Yuramarca for lunch, where we met a little girl with whom we danced and pretended to be a variety of different animals. From there we had a brief downhill before climbing up to Huallanca. Huallana was a strange place, a sort of factory town dominated by the operations of Duke Energy. In fact, all four hotels in the small town were full with workers, so we ended up camping beside the church, in view of a couple of security guards who promised to keep an eye on us. Unfortuately, Glenn did not have a restful night. His stomach was upset most of the night, we are still not sure why, as my stomach was fine and we had eaten the same foods. The next morning, he decided he wanted to just make it to Caraz where we would rest a bit. Glenn says that our fifth day of this stretch was probably his hardest day of riding yet. We rode only 40 km, but gained 1000 m, and half the ride was on dirt roads. We where riding alongside the famous Canon del Pato, and we passed through and unbelievable 35 tunnnels over the course of 20 km. It was a stunning ride, but the increased traffic, combined with the rough road and one-lane unlit tunnels, required a lot of concentration... and resulted in a lot of dust being inhaled. Finally we made it to the pavement, and breathed sighs of relief! Still, Glenn was having a hard time and we slowly made out way to the town of Caraz. Caraz is a small town, but down have a bit of a tourist infrastructure. We were able to find a cheap place to stay, and decided the next day would be a rest day. Glenn spent most of the next day resting or sleeping, And I washed our dusty and crusty cloths. Glenn was feeling much better by the evening, and we decided to continue our climb to the city of Huaraz the next day. We ended our day in the little town of Catac, where the entire main street was under construction, which resulted in our hotel shaking quite often. We were up at 3600 meters, and it was cold that night... as well as the next morning when we took off. Our final day took a long time... I was moving pretty slowly as we climbed. Glenn did not seem to be as bothered by the thin air and led the way. There was almost no traffic or settlements, and it was incredibly quiet and peaceful. When we reached the little town of Conococha, we were very tired and opted to take the $6 very basic room, rather than organize food and water for camping. We did cook our own dinner, and were glad to discover that our stove works just fine (if a little slow...) at 4100 meters. For the next three days we had more headwindy, bleak, coastal riding. Which served to remind us just how amazing the mountains are. It was a mental challange to carry on, especially on those long gradual uphills that look flat... and leave us wondering ´ Why are we going so slow!!!!!¨. But we did have some bright moments. We met a man who had made himself a four-wheeled bicycle to collect cans and bottles with. He spent some time talking to us about his plans for upgrading his bike to allow for more cargo. We also came across a bike race in the town of Huacho, and somewhat embarrassingly we became more a spectacle than the race itself, as everyone wanted photos with us! We also stayed at a very interesting Hare Krishna retreat the night before we rode into Lima. It is a little sanctuary with many domed buildings called ´trulys´, we were able to camp there for not too much, and also get an excellent vegetarian dinner. Our ride into Lima was its own entire saga... possibly the most challenging riding, in terms of traffic and pure chaos, of the entire trip. We left the Hare Krishna´s with gifts of fruit and headed along the ´Pasamayo Snake´, a stretch of highway that hugs the coast along a huge sand dune for 21 km It is technically only for trucks and busses, and there was not much of a shoulder... but it was a lot shorter and a lot cooler than the Panamericana that parallels it further inland. To make this first part of the ride more interesting, a dog... that the hare krishna´s affectionately called ´Doggie¨ followed us for 15 km! He was a lovely dog, but a little scared of everything so he would often run right in front or beside us as we rode. This made trying to avoid the trucks, and the steep drop off to our right, a little challenging. Fortuantely, when we reached a long downhill Doggie could no longer keep up. We hope that he headed back to the Hare Krishna´s because we don´t think that his life in Lima would be very fun. After the ´snake´ road we hit the main highway... and the expanse of Lima began. Potholes, busses, motos, vans.... pulling in and out at every direction... for over 40 km! It was very very intense, and I am sort of amazed that we survived unscathed. Finally we made it to the historic district, which was just off the highway... and after a short time found a place to stay. The final treat of this stretch was my sister Meghan arriving!! She came in late on the same day we arrived and we will spend the next two weeks hanging out with her. 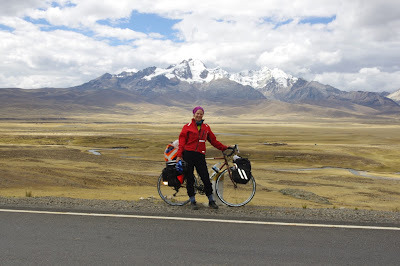 She has rejected travel by bike, as it involves bleak deserts, intense traffic, and major mountains in this part of the world. So we will take a break from the bikes, spend some time in Lima and visit some nearby towns by bus as well. In about a week and a half we will come back to Lima and head off on our bicycles towards Cusco!